I hope you have enjoyed this month's sneak peeks as much as I have. The design team has done a wonderful job sharing just how versatile this set is. I always try to bring you relevant designs that are multi-functional. 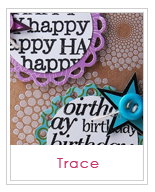 This is another set, that though it's focus is around birthdays, can be used for many occasions and can truly fit all styles. Not only is this set perfect for cardmaking, but great for scrapbook layouts as well as Jinny always demonstrate so perfectly. Now it's time to stop teasing you and reveal Pile It On and it's coordinating die in their entirety before they become available for purchase at www.wplus9.com at midnight tonight. And remember, since we have a small release this month, I will be selecting 3 random winners from all posts during the release to win Pile It On and the coordinating die. Leave me a comment by 11:59 PM EST May 31st. Want more chances to win? That's up to 4 comments per day! Good luck, and as always, THANKS FOR JOINING US! Welcome back to day 3 of the Wplus9 June Release! 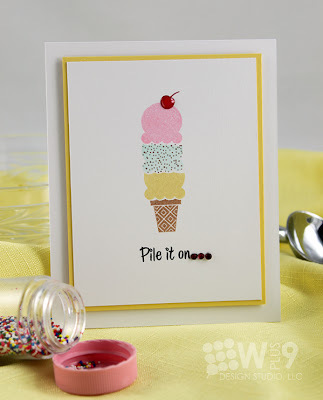 We are having a blast sharing our sneak peeks at our newest stamps set, Pile It On, which will be available for purchase on June 1st at the store. I have been seeing a lot of ice cream popping up in the industry lately, and this set is spot on. Today I've got more CAS styles to share with you from this delicious set. First up, a colorful card piled high with style. I used the masking technique I shared with you in yesterday's post and video to create this triple decker cone. I started my sentiment on the front, and then finished it off on the inside with "birthday calories don't count!". Keeping it very CAS on this next one, I focused on one of the candles included in the set and the "Happy Birthday" sentiment. I'm over the moon for this one. Talk about mass produce potential! 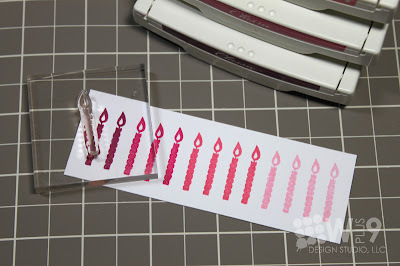 I started by stamping the candle repeatedly in graduating shades of pink across a horizontal strip of white cardstock. Then, to frame the strip, I added the the dotted journaling line across the card base, underneath the row of candles. I added my sentiment offset to the right just above the strip. 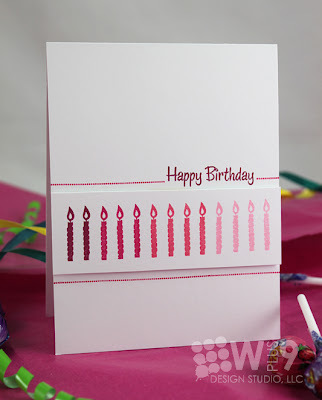 To finish off this card, I flanked each side of the sentiment with the journaling line again, and adhered the row of candles using dimensional foam. I loved this layout so much, I created a couple more in blues, greens, and yellows. Have you seen the digital stamp set Cool Pops that was added to the store earlier this month? 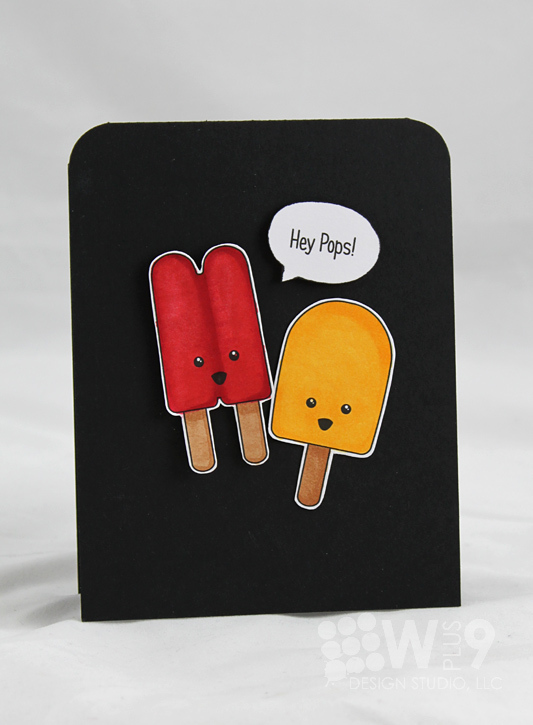 This is a perfect economical set for those quick Father's Day Cards and more. I just love coloring them in. There you have Day 3. I'm so happy to hear how enthusiastic you all are for this set and die. Thank you so much for stopping by each day and for the support you provide with each of your comments! Since we have a small release this month, I will be selecting 3 random winners from all posts during the release to win Pile It On and the coordinating die. Leave me a comment by 11:59 PM EST May 31st. Want more chances to win? That's up to 4 comments per day! Thanks for stopping by, and I hope to see you tomorrow for the full reveal! Welcome back to day 2 of the Wplus9 June Release! Did you get a chance to check out the Design Team's projects yesterday? Those ladies are amazingly talented! If not, don't worry, we've got more to show you today. 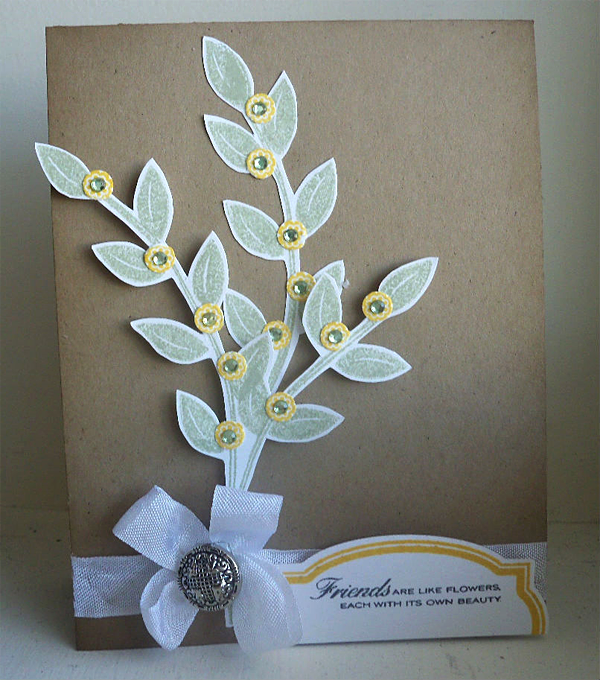 First up, a fast and fun party invite. 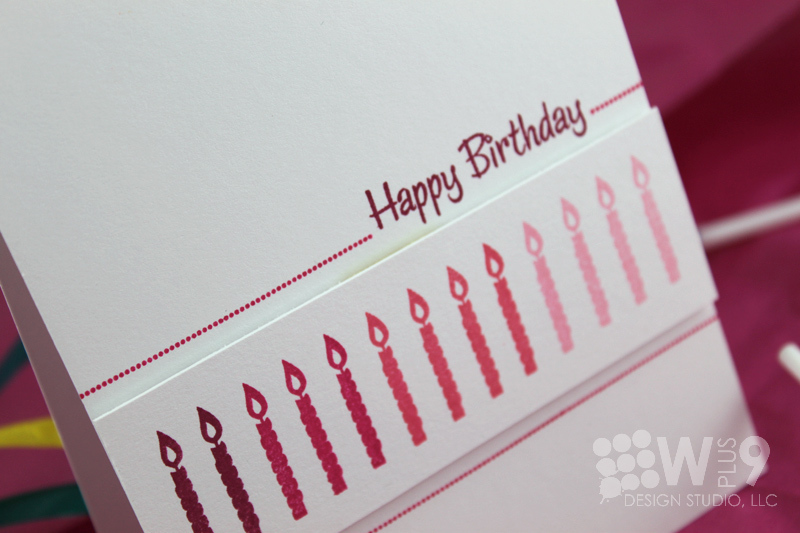 This card is full of style and mail friendly. For the front of the invite, I used the Pile It On steel rule die and October Afternoon's Schoolhouse and 5 & Dime patterned paper collections. On a side note, I believe OA has single-handedly converted me to a patterned paper lover! Fantastic color and patterns. Just love them. OK, back to the card. 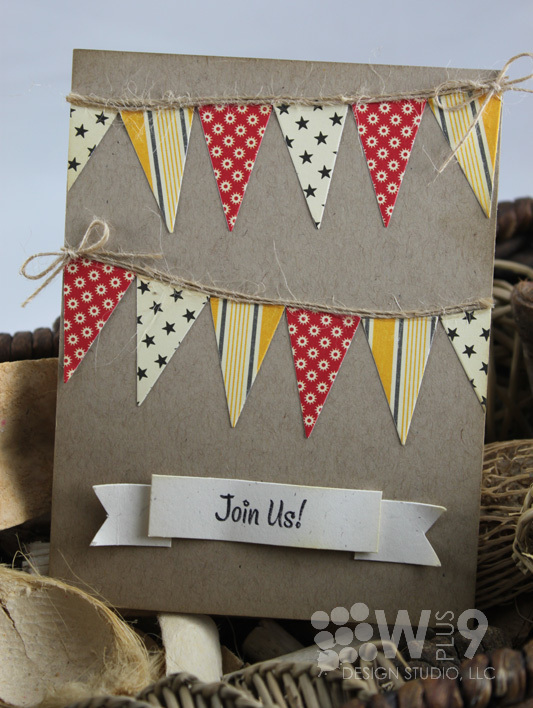 The Pile It On die includes a group of 3 pennants, making it easy to cut multiples and finish an invite like this in a snap. For my sentiment, I hand cut out a little banner, stamped "Join Us", inked the edges and added a little movement before I adhered it. For the back, I trimmed out a panel 1/4" smaller than the base. On the panel I stamped the journaling line included in Pile It On 4 times. 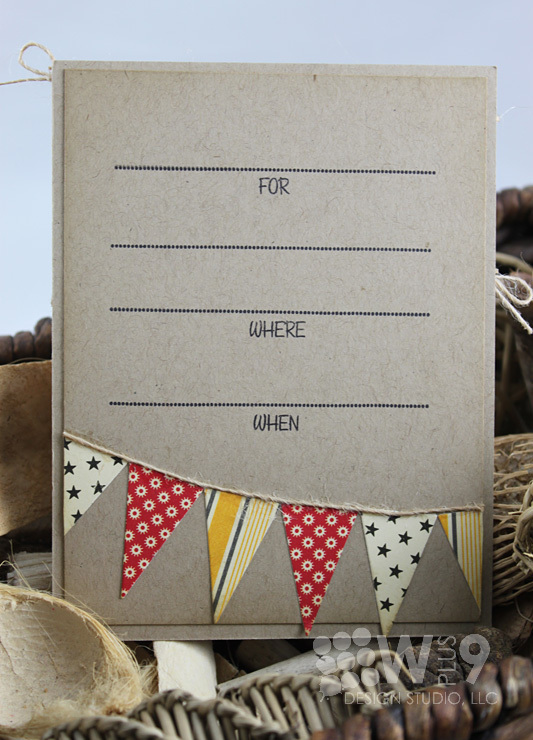 (I stamped two lines for the "Where", this is where I like to add the RSVP number or any special instructions). I added "For", "Where", and "When" under each line using the sentiments also included. I finished it off by repeating the pennants across the bottom. I just love how sophisticated and mature this looks in spite of using the pennant banner. 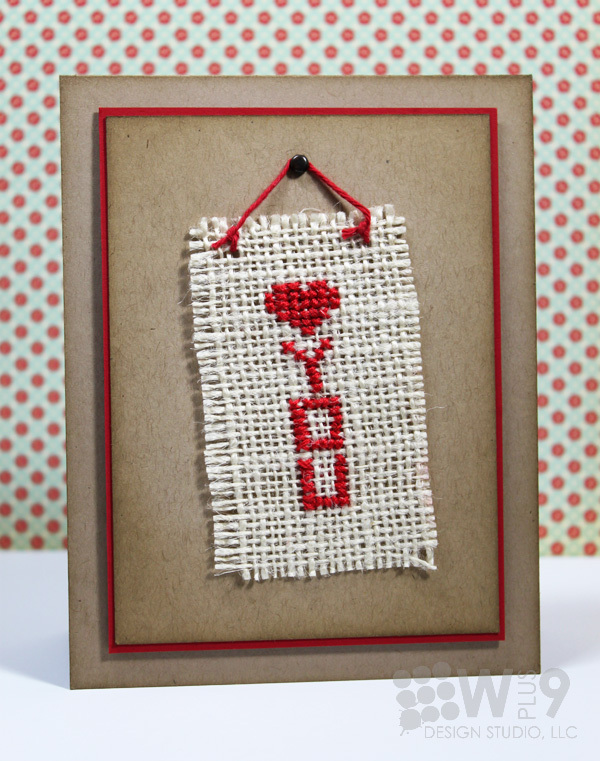 Next up...a fun card to send to your girlfriends that you haven't heard from in a while. Watch above or watch at YouTube. And that is a wrap on Day 2. Since we have a small release this month, I will be selecting 3 random winners from all posts during the release to win Pile It On and the coordinating die. Leave me a comment by 11:59 PM EST May 31st. Want more chances to win? Thanks for stopping by, and I hope to see you tomorrow! Hey, hey! We are back, and back on schedule! And it's that time again...release time! 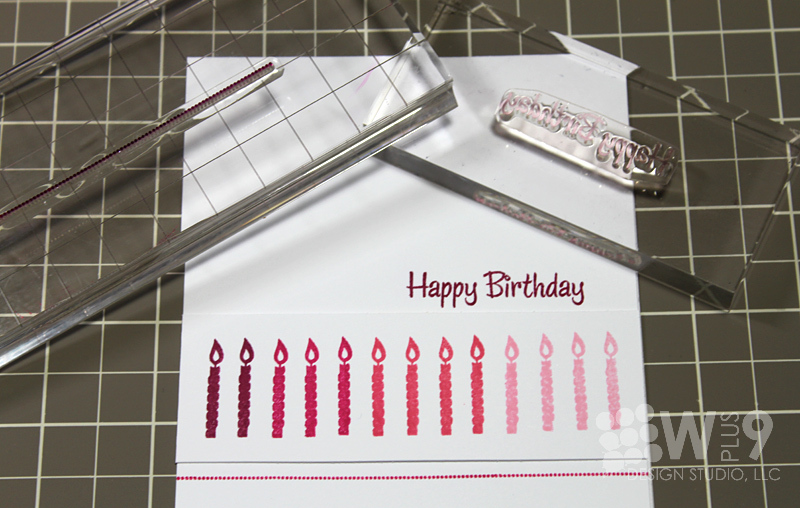 This month we have 1 new stamp set and a coordinating die to introduce (more on this tomorrow). Let's get started! 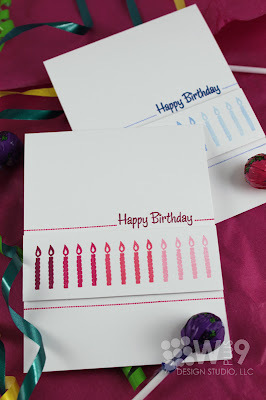 Over the next couple of days, we will be giving you some sneak peeks of this super fun birthday set. 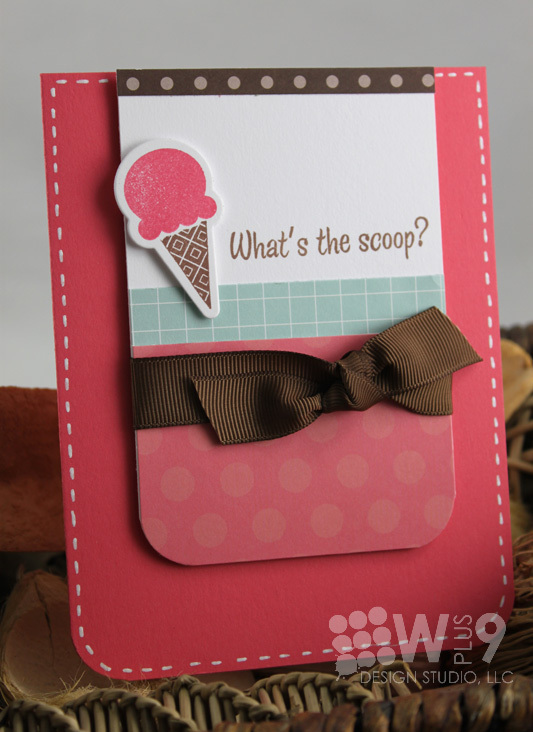 This set is packed with celebration possibilities! But don't let it limit you to birthday use, there are also some fun sentiments for everyday use thrown in as well. 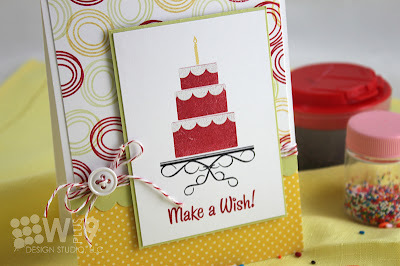 Today's card is a fun, bright and cheerful birthday card that mixes a couple of older sets in as well. 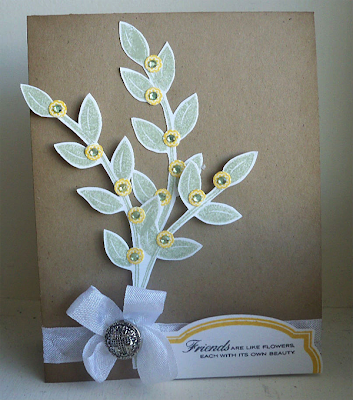 I started this card by creating some background paper using the circle image from Funky Flowers in red, green, and yellow. Building my focal image was a piece of cake (pun intended!). 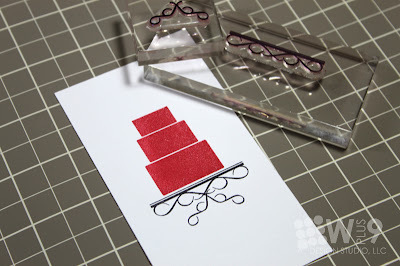 I started by stamping the tiered cake image in red. The "cake stand" was actually created using Filigreed Frames. I stamped the shelf-like flourish image first as the base. Then I added the corner flourish image directly beneath it to create the feet of the stand. How cool is that?! To add the scallops to each layer of the cake, I used one of the 3 decorative elements included in the set. 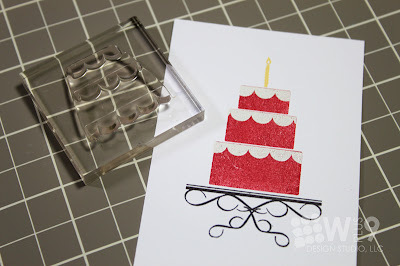 I stamped it in Versmark and then heat embossed it in white. 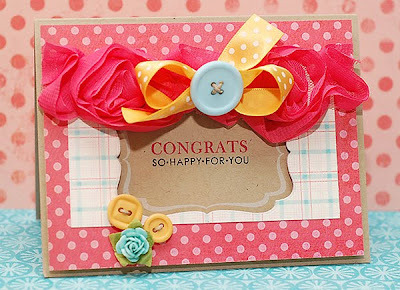 I've also include a cute little ribbon and bow stamp in the set. 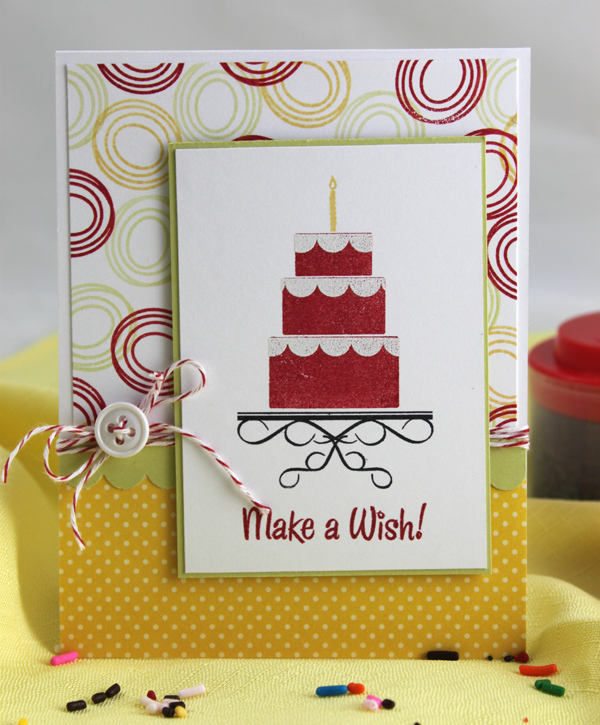 This allows the tiered cake image to double as a stack of presents! I finished the card off with a little candle and the "Make a Wish" sentiment, both included in the set. 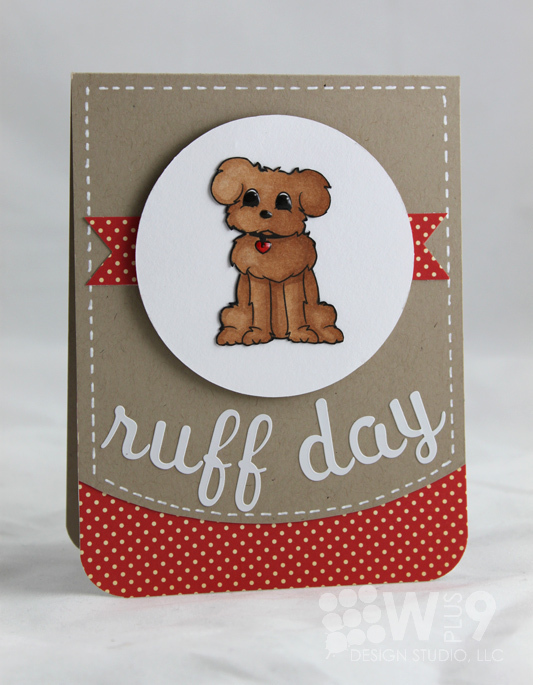 I just love how cheerful this card is. And perfect for all ages too. Now, I also wanted to give you guys a little peek at a new digital set that I added to the store earlier this month, Izzy. Oh my goodness, I just love that little pup! I printed it out onto white cardstock and colored her in with Copics. I then trimmed her out and adhered her directly to a white circle. So there you have Day 1. Since we have a small release this month, I will be selecting 3 random winners from all posts during the release to win Pile It On and the coordinating die. Leave me a comment by 11:59 PM EST May 31st. Want more chances to win? It is with great pleasure that I have the honor of introducing the newest members of the Wplus9 Design Team. These ladies are simply AMAZING. I have admired their work for some time now and I feel so lucky to have them joining the the team. Both of these ladies are HOT, HOT, HOT and blowing up the blogosphere and newstands! 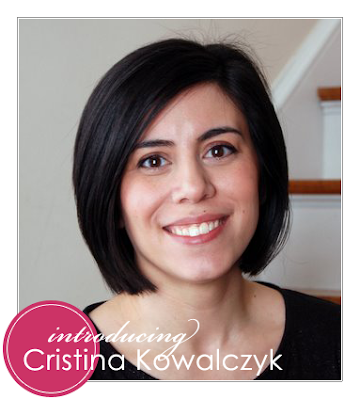 Please help me welcome Cristina Kowalczyk and Jean Martin. Cristina is the author of two books – a short story collection called Come Together, Fall Apart and a novel entitled The World in Half. She’s currently working on her second novel while also taking care of her 4-year-old daughter and being a wife to her amazingly supportive husband. On top of that, she tries to squeeze in cardmaking time every day, and you can find her work in recent issues of Paper Crafts and CARDS. 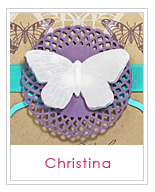 Cristina discovered cardmaking about a year ago when she went to a Stampin’ Up! stamp camp and hasn’t looked back since. 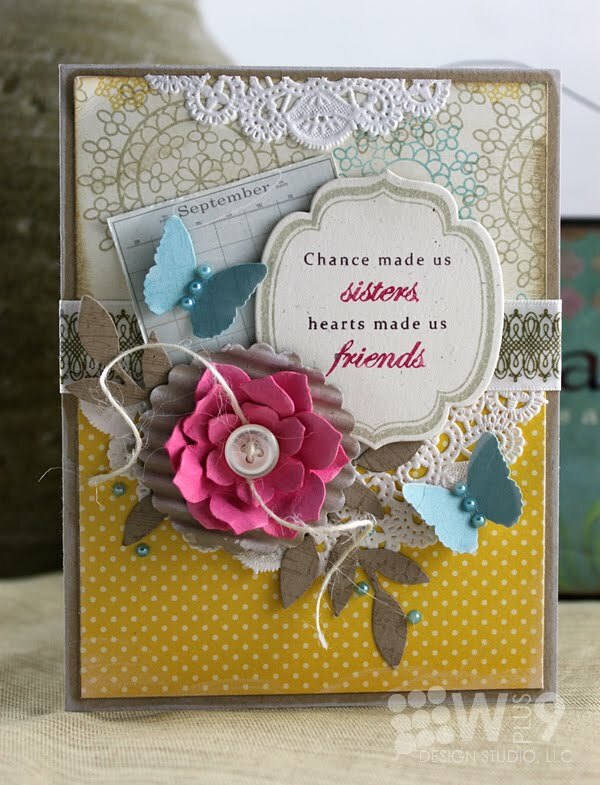 A self-proclaimed stamper at heart, she has a CAS style, although she loves looking at lots of different styles – there’s always so much to learn! Cristina lives in the western suburbs of Chicago. Cristina's unmistakable clean and graphic style is truly something to envy. Jean Martin lives in Long Island, New York. Originally from the Philippines, she came here in 2008 to marry her best friend, Ren. Happily married for 2 years and 8 months now, they are owned by 3 cats who keep them very busy. 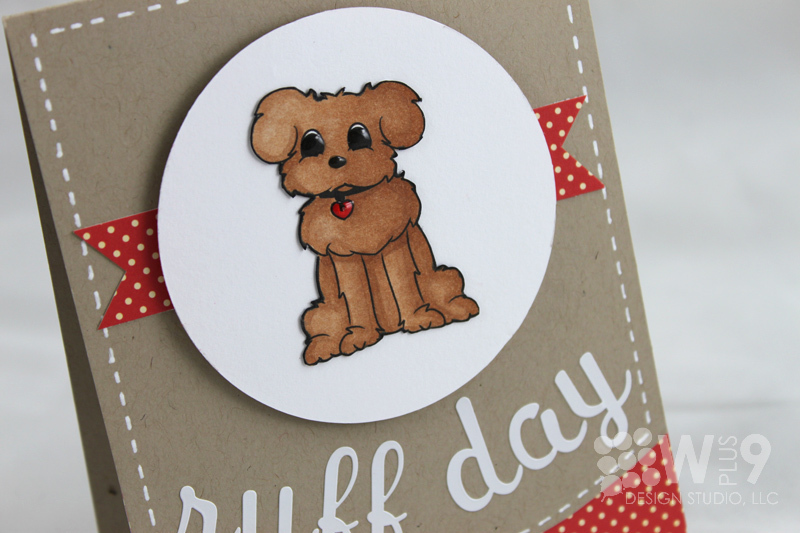 An Office Manager at their family-run veterinary hospital, Jean has always wanted to try her hand at graphic design. 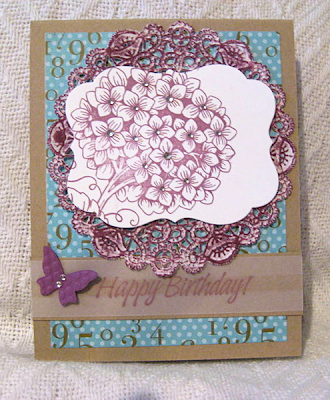 She started blogging and card making January of last year. 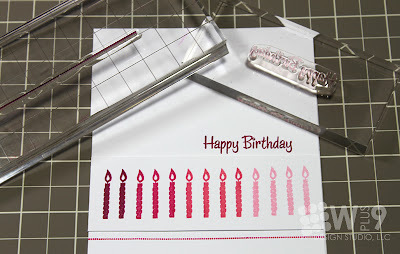 Scrapbooking provided a gateway into paper crafts, but didn't hold her interest for long. 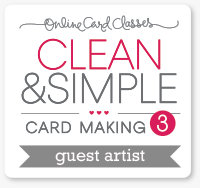 Cardmaking hooked her permanently. Through joining challenges online, she was scooped up to join the Design Teams of some of the best challenge sites in blogland. She is totally enjoying her new hobby and I hopes to be doing so for a long, long time. 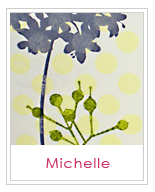 You can find her at http://www.stampin-scrapper.blogspot.com. 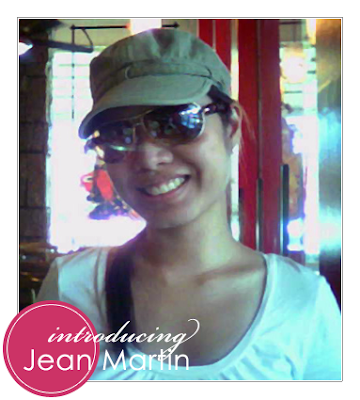 Jean's soft and romantic shabby chic style is one that, I myself, simply love. Her use of color and embellishments is truly stunning. Welcome to the team ladies, we're going to have a fabulously inspired time! This month we are focusing on fabric! 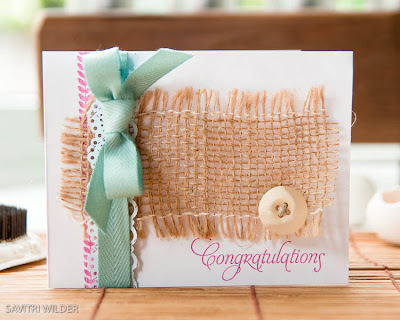 I don't often use fabric, other than ribbon, on my cards. In fact, as of late, I haven't even used much ribbon in my projects. So when trying to come up with a topic to focus on for this month's All Eyes On, I just knew fabric would be a perfect challenge for myself. 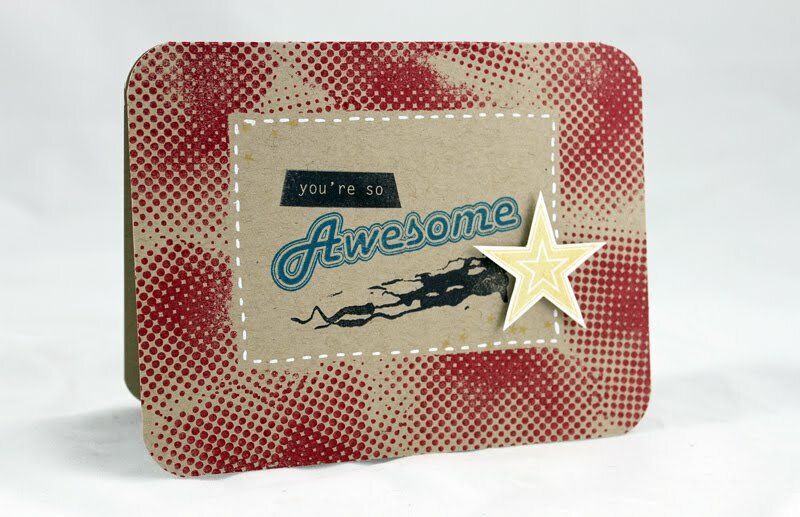 I was inspired by this card by the fabulous Angeline Yong. 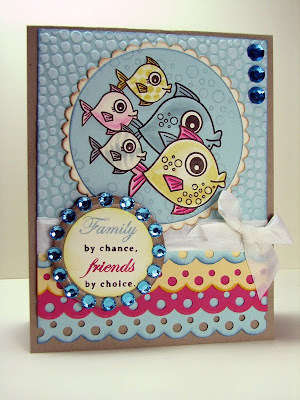 You can also find it in Papercrafts Card Creations Volume 9. I fell in love with the stitched heart and immediately thought of using a strip of burlap to cross-stitch my sentiment onto. The weave is much more loose than your convential cross-stitching fabric, so a little more patience and care is needed get the stitches even. But I think the end result was definitely worth it. I decided to keep this one CAS (see, I haven't abandoned my first love), and added a brad and some twine to create a little hanging banner. Create a card, scrapbook page, digital layout, tag, whatever...just make sure to use the colors noted in the graphic above. This month we are using Kraft, Bright Pink, Dusty Blue, and optionally yellow. 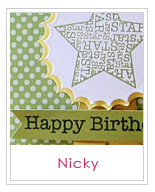 For reference, I used Stampin' Up! 's Kraft and Seirra Sand, Melon Mambo, and Baja Breeze. As always, white/cream and/or black/brown is allowed for neutrality. 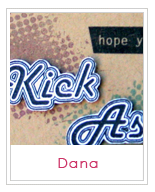 Create your project and post it to your blog or online photo gallery such as Flickr or SCS. Add a direct link to your project (not your homepage please) by clicking the "add your link" button below. You have until June 7th at 10:59 pm EST to play along. You will know the deadline has passed when the link to add your project is no longer available. 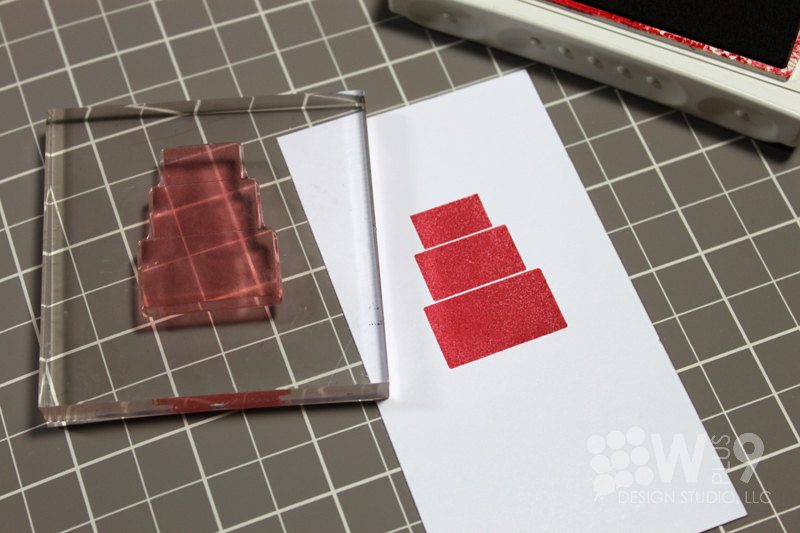 One random winner will be selected to win a Wplus9 stamp set of their choice. Three additional honorable mentions will be selected by me. Ready for a little inspiration to get you started? I used a bunch of different stamps and supplies on my card. The background patterned paper was created using Mendhi Medallions. For my sentiment I used our All Occasion Label die and coordinating Brothers & Sisters stamp set. Now it's your turn. Can't wait to see what you come up with! Happy Friday! Oh Happy Friday! I don't know about you, but I am so flippin' happy it's Friday! I tried to get this up last night, but as many of you know, Blogger was not being a very gracious host yesterday. But alas, it finally decided to open the door and here we are. Are you ready? It's On Cue time! I am officially changing up the winning format on you guys. Awe...I know, I know, but you're gonna like it, I promise. We all know that I have not been the most timely at posting the winners, and I know that it is not fair to you guys. I myself, stalk challenge blogs waiting for the winners to be announced on the rare occasion that I get to participate. Because let's face it, we all love recognition. So we will be moving forward with a format that is a little easier for me to keep up with. One random winner will be selected to win a Wplus9 stamp set of their choice. In addition, Three honorable mentions will be selected by myself. All participation rules remain the same. So what do you think? I told you that you would like it. So let's get on with the winners from the Color Cues that I am (shamefully) behind on. Congratulations Katie and Shazi! Email me at dawn@wplus9.com to claim your prizes. 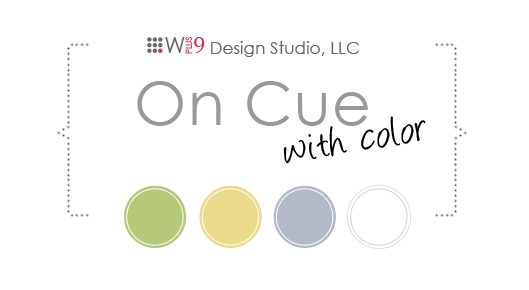 I always enjoy looking through all of the fabulous Color Cue submissions...picking out favs just keeps getting harder and harder. You are all so amazing! 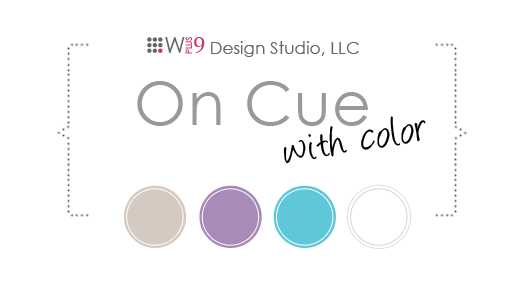 The next Color Cue will be up on May 15th, see you there. Sorry it's been a little quiet around here. We've had a lot going on here lately. Some of you may remember that I've been crafting out of my dining room. Well, we finally moved the boys in together to share a room and set one of the rooms up as an activity room. So half is mine to craft and run the business, and half is for the boys to play. I've been busy moving and organizing everything. This should help me to better manage all of the administrative stuff for Wplus9, as well as give me an area that I can leave projects and come back to. It's quite limiting when you have to completely clean up after every crafting session. Another reason would be a sort of mourning. As a lot of you have probably read Hannah Craner has had to leave the Design Team. I will miss her contributions terribly, but I am extremely excited for her new opportunity. She was offered the position of Editor at Cards Magazine! Myself and the Wplus9 Design Team are so happy for her. It has been such a pleasure to have Hannah on the team, but I look forward to getting Cards Magazine every month and seeing the magazine under her leadership. Congratulations Hannah! So today's card is quite fitting for letting her know just how I feel about her, as a friend, a designer, and an inspiration. Martha Stewart, I am not. But, occasionally I can fake it. We all have them. Those "bring a dish" parties. Whether it's an office potluck, a friendly gathering, or a kid's activity event. And I don't know about you, but I am ALWAYS last minute. 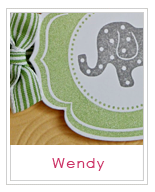 And of course, like many of you, I have the "crafty-creative" title to live up to. But you know what...sometimes, I'm just not feeling it. You know? So this weekend was the Cub Scouts pool party. Each den was assigned to bring something, and our den was assigned desserts. Great, why couldn't we have gotten drinks or even plates/napkins, etc. So, I needed something kid friendly that wouldn't melt since it was outdoors. 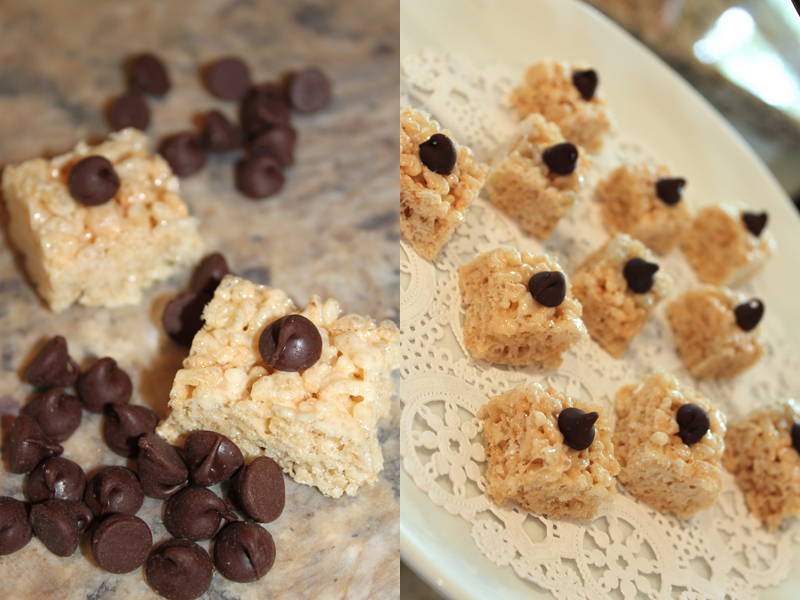 Hmmmm....Rice Krispy Treats! Every kid loves those crunchy marshmallow-y gooey yummy squares, right? (well, every kid but mine that is) Great! So on the way home from my girlfriend's mother's shower, I picked up a box of cereal and a bag of marshmallows. It's been a long time since I made Rice Krispy Treats. And I forgot just how little one box makes. Especially when it's a pool party for the whole pack. Well, in true Dawn fashion (late), by the time I discovered this, I either a) didn't have time to go to the store and buy more, or b) was too lazy to go to the store and buy more. Either way, I needed to get inventive. So here's what I did. 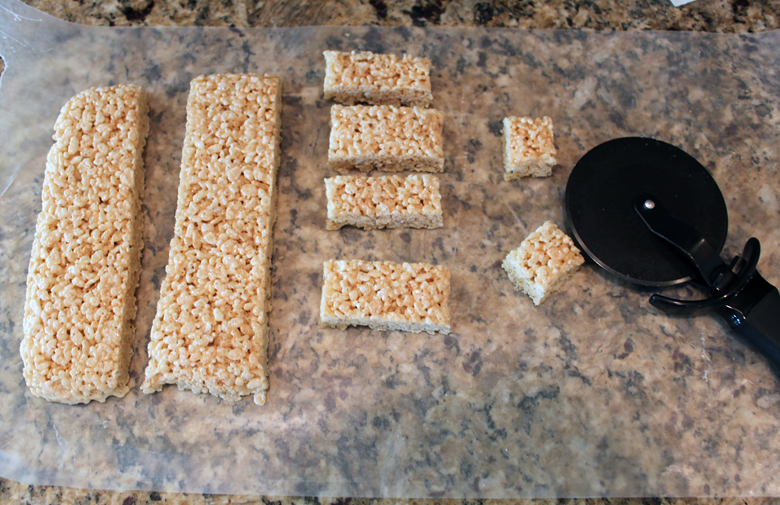 After preparing the pan and letting it cool, I used a NON-STICK pizza cutter to cut the treats first into strips, then into rectangles, and finally into squares. They still looked kinda plain, and pathetic, and generally unimpressive. I stood there staring at the sad little things and it hit me. Chocolate chips! I topped each one with a single chocolate chip. Voila! 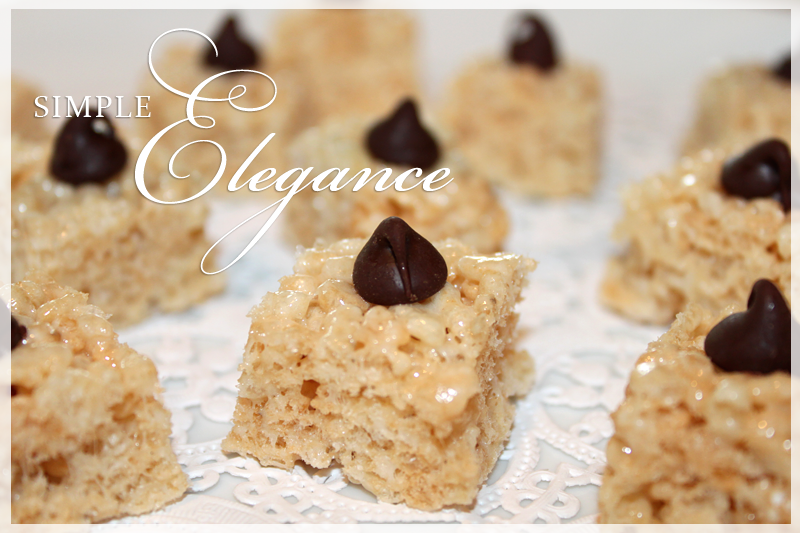 Perfect little bite-sized morsels of crunchy-gooey-chocolatey yumminess! These actually turned out to be the perfect size since there were so many desserts. None went to waste, they were a big hit, and I ended up with just under 100 little squares!